"What’s new?” is a old question. Among our foods, microgreens are new, indeed both new and young. 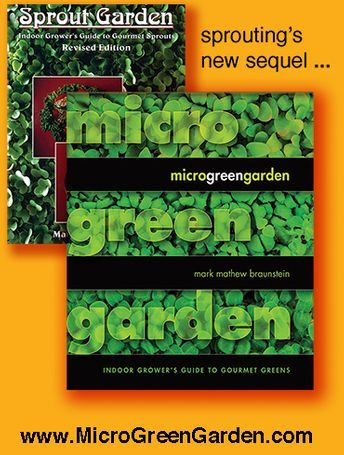 First coined in 1997 just in time for the new millennium, even the word microgreens is new. Microgreens are the young seedlings of herbs, veggies, beans, seeds, and grains. No one embarked in a canoe to discover microgreens in the far reaches of the Amazon, nor conducted experiments to invent them in a lab. Microgreens were here all along, right under our noses. For many centuries, our human family has cultivated and eaten the more traditional mature stages of these same plants. Ours is simply the first generation to harvest these tiny greens in their infancy, sometimes even intending these seedlings as foods for an entire meal. In this new millennium, you are a pioneer exploring new terrain. You are holding in your hands your trail map. While some impatient food writers and zealous microgreen farmers tout the nutritional contents of microgreens, in fact research is scant about their total nutritional profile. These little leafies are so new to our menus that we really don’t know beans about microgreens. Until further research is conducted, the nutritional value of microgreens can only be inferred from what already is documented about their forebears, calledsprouts. 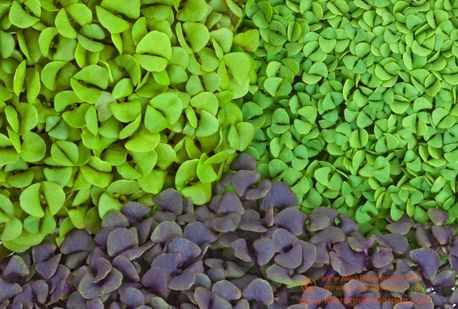 Even if the vitamin and mineral contents of microgreens someday are proven not to measure up to the powerhouse of sprouts, we do know that microgreens boast two compensatory nutrients, namely phytonutrients and chlorophyll. Chlorophyll is what makes greens green. When exposed to light a sprout develops chlorophyll, turns green, and so becomes a microgreen. Chlorophyll is a miraculous solar panel that harnesses the energy of the sun and converts it into plant matter. As a nutrient itself, chlorophyll has antiseptic and anti-inflammatory properties, and guards against and can cure some types of anemia. Its presence additionally indicates that the plant is busy creating more plant. That means more plant sugars, more plant starches, more plant fibers, more vitamins, more minerals, more enzymes, and more phytonutrients. Phytochemicals, also called phyto-nutrients, are a broad range of substances in plants (phyto means plants or plant-based) that promote health, prevent disease, and likely even help cure disease, including cancers. The plants produce phytochemicals to protect themselves against insects, diseases, and other menaces of the harsh world within their little patch of turf. Generous by nature, plants share the benefits of their phytonutrients even with the animals who eat them, including with us. Phytonutrients are found in all plants we eat, and especially when we eat them whole and raw. Among fruits, they are most potent in berries and cherries. Among veggies, they are most concentrated among the Brassicas, a large family that includes broccoli, cabbage, and kale. Phytonutrients are especially rich in Brassicas during their early stages as sprouts and microgreens. Thus our quest for lifelong health and prolonged youth is greatly enhanced by diets which include healthy doses of healthful plants in their own youth. Microgreens start as sprouts and then keep on growing. Sprouts are footloose, while micros put down some roots. Sprouts thrive under cover of darkness, while micros seek the light of day. Growing sprouts is simple and easy, compared to which growing microgreens might seem complicated and messy. Sprouts are very forgiving, while microgreens can be very demanding. If you’ve mastered the science and craft of homegrown sprouts, it’s time now to advance to homegrown microgreens. A new world awaits you. Are you ready? This website about CONTAINER GARDENING provides half of the full manuscript of the published book and eBook, but NONE of the book’s 2nd half.